There is a lot of renewed interest in tide prediction machines and, after many years hidden away in storerooms, some of the machines made in the UK are on permanent display once again. Kelvin’s original 10-component machine is now part of the new Winton Gallery for Mathematics at the Science Museum in London alongside Ishiguro’s storm surge simulator. Two of the machines that were used at Bidston can now be seen at the National Oceanography Centre building in Brownlow Street in Liverpool. As you may know from articles mentioned in the Resources section of this web site, the tide prediction machines were a way of simulating the tide in terms of its many harmonic components. Each component would be represented by an amplitude and phase lag, called the ‘harmonic constants’, and the machine, which can be considered as a sort of analogue computer, would be programmed to run by providing it with these constants. Of course, the constants would differ from port to port. That raises the obvious question of where people like Arthur Doodson, and the other operators of the machines, got their constants from in the first place. This short article reviews the main characteristics of one of the machines (the so-called Doodson-Légé machine now on display at NOC) and then attempts to answer the question of how Doodson obtained the constants. The Doodson-Légé machine simulates the variations of the ocean tide by representing the tide as a combination of 42 constituents, each of which has a particular amplitude (h) and phase lag (g). The values of h and g are ‘programmed’ into the settings of the 42 wheels, and the nickel tape that wraps around and connects all the wheels serves to sum up all the constituents. Figure 1. 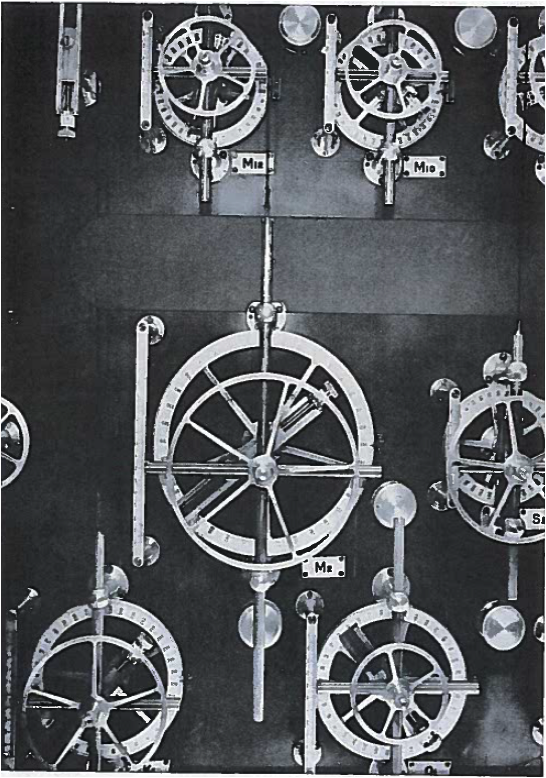 Some of the wheels of the Doodson-Légé Machine (from Doodson, 1951). S2, with a period of 12 h (the main semi-diurnal tide from the Sun with a period of half a solar day). At Liverpool, M2 and S2 have amplitudes of 3.13 and 1.01 m respectively. 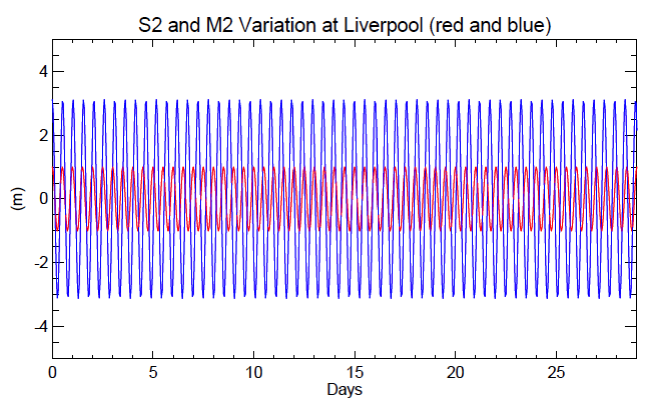 Because our day is 24 hours, the S2 tide will repeat itself twice a day exactly at the same time every day (shown in red below). M2 has a larger amplitude and repeats twice a lunar day (a little later each time) as shown in blue. They combine by ‘beating together’ to give a classic ‘semi-diurnal’ tide where M2 and S2 together result in a total tide that is larger and smaller over a fortnight, called spring and neap tides. 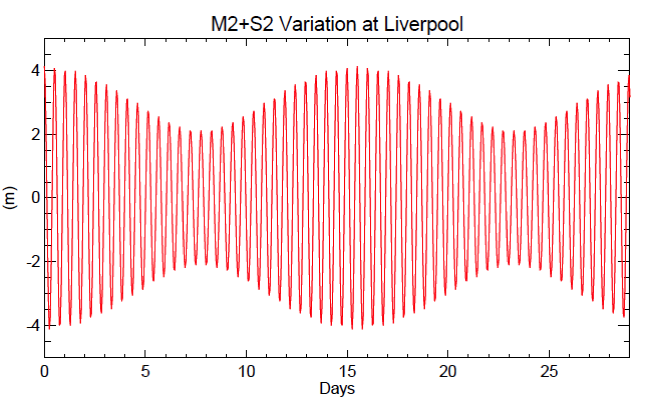 You can appreciate that simply by combining the separate contributions of these two constituents (M2 and S2), we already have a curve which starts to look something like the real tidal variation at Liverpool over a fortnight. The fact that the tide can be parameterised this way, as a simple addition of harmonics (but many more than two), made it technically easy to invent machines such as the D-L machine that could sum them up. Some machines could handle 40 or more constituents. That was important in order to be able to handle the many smaller constituents that contribute to the tide (not just M2 and S2). Also, in other parts of the world, the total tide can have very different characteristics to that at Liverpool and so the machines needed to be able to handle their particular constituents. See Pugh and Woodworth (2014) for a discussion of why these different types of tide occur. As mentioned, the D-L machine has 42 wheels (or constituents), which means that we need 84 numbers to ‘programme’ it (i.e. the amplitude and phase for each constituent for the port in question). Once it has been set up correctly, then it can be run to predict the tide at the port for many years in the future (or past). But how did Doodson know what these 84 numbers were in the first place? The 84 numbers come from analysis of previous observations of the tide at the port using a tide gauge. Normally one year of data was adequate, with observations of the water level every hour (i.e. about 9000 values in a year). The team of people who worked with Doodson (called his ‘computers’) usually worked with values of water level in units of 1/10 of a foot and expressed as integers. There is a lot of arithmetic involved in this work and integers are much easier to deal with than real numbers. His method of analysis of the hourly values made use of ingenious arithmetical filters designed to emphasise the importance of each constituent in turn and so, after a lot of work, arrive a set of estimates of amplitude and phase for all 42 that could be used to programme the machine. The work was very labour intensive, involving endless integer arithmetic by someone who could add up properly. Analysis of a year of data could take a ‘computer’ a few days or a week. The procedures are described in Doodson (1928) and Doodson and Warburg (1941) although be warned that a reader has to devote some hours to understand them. Now, the people in those days before digital computers could not readily handle 9000 hourly water level values in most of their work, and it turns out that for Doodson’s tidal analysis it is not necessary, as long as the data is good quality. Doodson invented a set of filters which would convert the hourly information into daily numbers, which are just as useful for the tidal analysis, and have 24 times less the bulk of the original data. The method they used was to list the hourly values from hours 0 to 23 each day on a page, one line for each day, and then have a cardboard cut-out with holes for the hours which had to be multiplied by a filter weight. These cut-outs were called stencils. The weight value itself was written on the cardboard, black for a positive weight and red for a negative weight. Figure 4. An original cardboard filter for X2 showing holes to show through the hours with data that had to be multiplied either by positive (black) or negative (red) weights. There were many pieces of cardboard like this for many types of filter. Note that the central value is 3 hours different from that of X2. So the two filters sampled orthogonal (or real and imaginary) components of the semi-diurnal variation. Figure 5. An original cardboard filter for Y2 showing holes to show through the hours with data that had to be multiplied either by positive (black) or negative (red) weights. You can see it has much the same information content as Figure 3 (i.e. variation over a fortnight and with two sets of amplitudes and phases) but with 24 times fewer numbers. 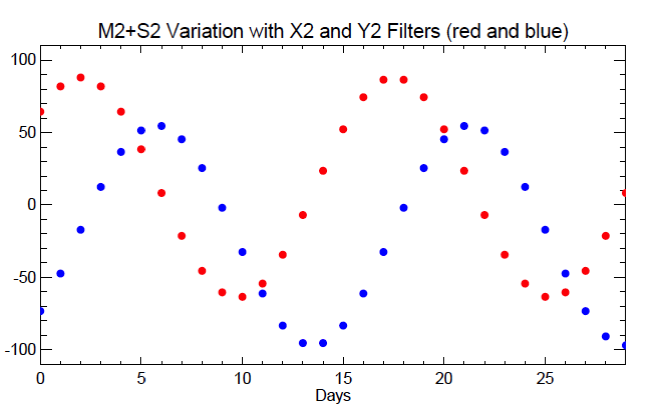 The constant parts (the offsets) of the red and blue curves come from S2, because S2 is the same every day. And the cyclic parts come from M2, which varies over a fortnight. The red and blue offsets give the amplitude and phase of S2, and the amplitudes and phases of the cyclic parts give the amplitude and phase of M2. So the first task of the ‘computer’ person was to calculate X2 and Y2 for each day (the work was done by hand of course, or sometimes with the novelty of an adding machine) and write the values for each day in a table with 12 columns (for 12 months of the year), with some columns having 29 rows, and some 30 rows. X2 (or Y2) values for days from the start to the end of the year (i.e. about 360 values) would be listed down column 1 first, then down column 2 etc. until the year was completed in column 12. The second step is harder to describe but in fact is the most important. 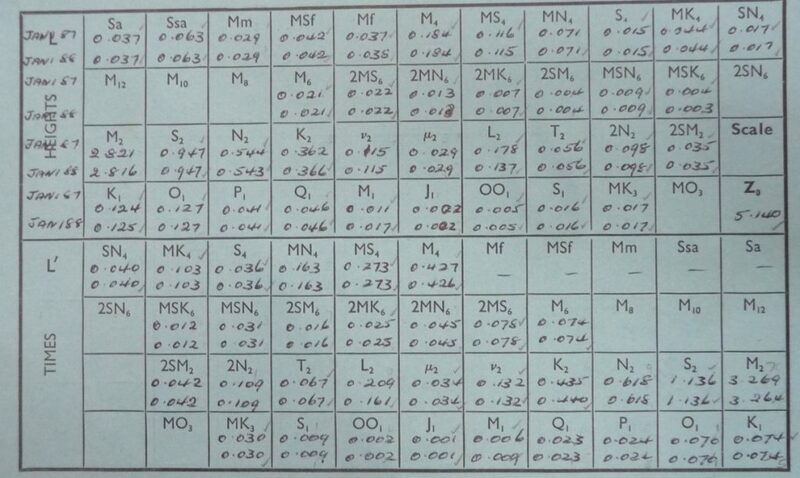 The X2 (or Y2) values in each of the columns of the 12 months in the first table were multiplied by different sets of integer weights to maximise the importance of the many different constituents with slightly different frequencies (called ‘daily multipliers’, see Table XV of Doodson, 1928). In addition, sums of the X2 (or Y2) values in each month, listed in each column of the first table, were multiplied by further several sets of integer weights for each month (called ‘monthly multipliers’, see Table XVI of Doodson, 1928). In our idealised example, after a lot of arithmetic, that readily leads to 4 numbers i.e. the 2 each we need for M2 and S2. The different constituents with periods around 12 hours (other than M2 and S2) have names like 2N2, Mu2, N2, L2, K2 etc. (and it will be seen that they all have their own wheels on the machine). They will all contribute to the hourly water levels to make the total tide plot of hourly values more complicated (Figure 3), and also to contribute individually to the X2 and Y2 values (Figure 6). The results of the filtering in the second step, by means of the daily and monthly multipliers, produces values that have contributions in different amounts from each semi-diurnal constituent. Therefore, the information from the second step needs to be recombined, using linear combinations of each parameter in a process that Doodson called ‘Correction’, in order to provide information specific to each constituent. This was also labour intensive but it was straightforward once a clearly-defined procedure could be explained to a ‘computer’. The method is described in great detail in his 1928 paper with a worked example for Vancouver (which has some mistakes that do not matter). Doodson then had all the amplitudes and phases that he needed to programme the machine. (In fact, the long-period tides were treated differently but they are not important for this note.) All the amplitudes and phases were written down on a special ‘constants card’ for the port in question which the machine operator would use whenever the machine was required for setting up for that port and year in the future; Figure 7a,b shows the front and reverse of an example card. 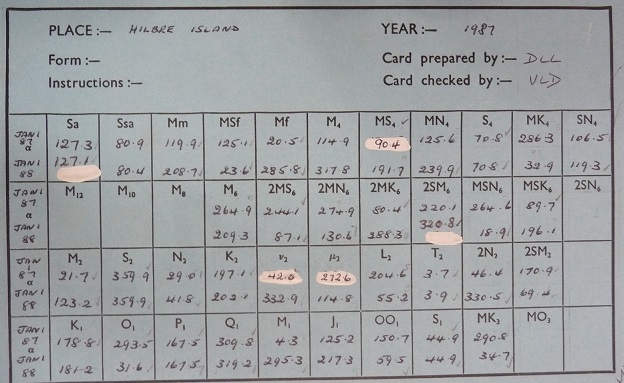 The top part of the first card shows amplitudes for each constituent in the order they appear on the machine for Hilbre Island for 1987 and 1988. The amplitudes are in metres and the lunar ones are slightly different each year because of the nodal variations (the ‘f’ factors). You can see the amplitudes for the solar constituents such as S2 are the same both years. The lower part of the card shows the values of frequency * amplitude for each year, with an overall scaling factor, which represents the rate of change of the constituent. The amplitudes are programmed onto the shafts (also called ‘amplitude blocks’) for each wheel on the front of the machine using a Vernier screw, and the values of frequency * amplitude are programed similarly on the back of the machine (i.e. the machine is a ‘double sided’ one, in effect two separate machines, one for the heights and one for the rates). Finally the phases for each constituent, shown on the reverse of the card for each year (e.g. Figure 7b), are programmed onto the wheels at the front of the machine using the rotating dials. In order to rotate the dials, it is first necessary to release the associated clutch, remembering to tighten it up again before running the machine, otherwise the contribution of the particular constituent would not be included in the total tide. These phases are not phase lags (or they would be the same for both years) but are values of V+u-g, where ‘V’ is the astronomical argument for the start of the year, ‘u’ is the nodal correction, and ‘g’ is the phase lag. These can all be readily computed for each year once one knows ‘h’ and ‘g’, as explained above. Was this Method of Doodson the Best or Easiest for Finding the Amplitudes and Phases? The Doodson method described above was by no means the first. You can find many papers from the 19th century which have lists of amplitudes and phases for the various constituents computed in different ways (e.g. see Baird and Darwin, 1885). The British Association method, as used by Kelvin, Roberts and Darwin. This was the method used by Roberts to determine amplitudes and phases with which to programme his earlier tide prediction machines. A method used by the US Coast and Geodetic Survey. The methods differed in the amount of labour involved, in how well they could eliminate the overlap of information from different constituents in the derivation of the amplitudes and phases, and in the completeness of the analysis. The BA method was the most arduous for the ‘computer’ person. Doodson’s method was largely an extension, and more complete version, of that employed by Darwin many years before. As always with Doodson, it was devised with more than one eye on subsequent application of the tidal information for use by the prediction machines. Doodson was excellent at handling numbers (and, as important, in showing how his ‘computers’ could handle the numbers) and the method he devised, although complicated and long-winded, was perfectly adapted to routine working by people with basic mathematical skills. Finally, we can refer to the work of Lord Kelvin (William Thomson), who not only invented the ‘Kelvin Machines’, as the Tide Prediction Machines (TPMs) like the Doodson machine were called, but also invented a mechanical analyser which he thought should be capable of the numerical tidal analysis described above. His prototype ‘tidal analyser’ allowed for determining 5 constituents and a later one allowed for 11. The 5 constituent machine can be seen at Glasgow University, while the 11 constituent machine is in the Science Museum, and both are described by Hughes (2005). However, Kelvin’s analysers were not successful and so hand-calculated computations of the Darwin and Doodson type were needed for many years. Nowadays, all the tidal analysis of a year of data can be performed in a split second on a modern computer using methods that have many similarities to those of Doodson (see Pugh and Woodworth, 2014). Valerie Doodson and Ian Vassie are thanked for comments on a first draft of this article. Baird, A.W. and Darwin, G.H. 1885. Results of the harmonic analysis of tidal observations. Philosophical Transactions of the Royal Society, 34, 135-207. Doodson, A.T. 1928. The analysis of tidal observations. Philosophical Transactions of the Royal Society, A 227, 223-279. Doodson, A.T. 1951. New tide-prediction machines. International Hydrographic Review, 28(2), 88-91 and 6 plates. Doodson, A.T. and Warburg, H.D. 1941. Admiralty Manual of Tides, His Majesty’s Stationery Office, 270pp. Hughes, P. 2005. A study in the development of primitive and modern tide tables. PhD Thesis, Liverpool John Moores University. Pugh, D.T. and Woodworth, P.L. 2014. Sea-level science: Understanding tides, surges, tsunamis and mean sea-level changes. Cambridge: Cambridge University Press. ISBN 9781107028197. 408pp.